Navigation menus have really important role in any website. For big sites full with a lot of pages and articles, drop down menus and tabs are popular because they can make it a lot more easier to navigate and move through site, also you can save space on website displaying content on dynamic tabs. Also if you want to create a navigation menu, that really stands out of the crowd, jQuery could be the right choice to choose offering bunch of customisable options. 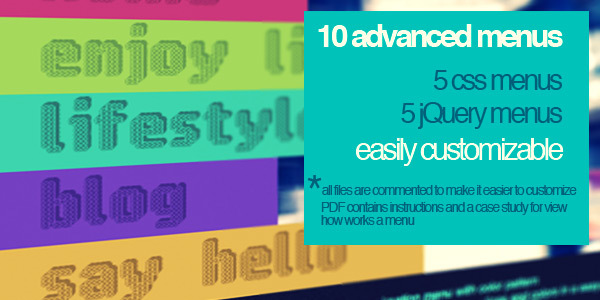 That’s why I present to you 36 really good jQuery menu examples for every need. 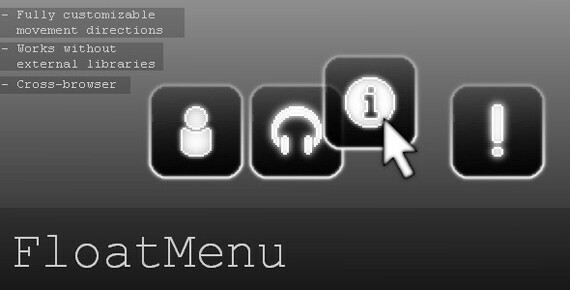 In this section you will find some great menu bar tutorials and examples of it. As menus are one of the most important thing on your website, it is important to stand out and give the best experience to the visitors. What if instead of going through the hassle of creating navigation menu by your own, you could get super functional and supported menu system for cheap? Think of the time saved.. Time you can spend relaxing now, because you have this super functional menu in your toolbox you can use over and over again! It’s no brainer, yes this is a premium menu, but it costs only $6 and you’ll get the most powerful menu you can imagine! How cool is that! 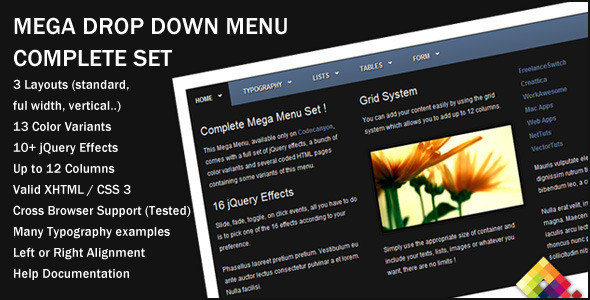 This is only an example, you can pretty much buy any menu you want for $5-10$ on CodeCanyon. The most complete solution to create mega menus. Now that you know where you can look for some great tutorials, we wanted to give you something more. Check out the sliding menu bellow. 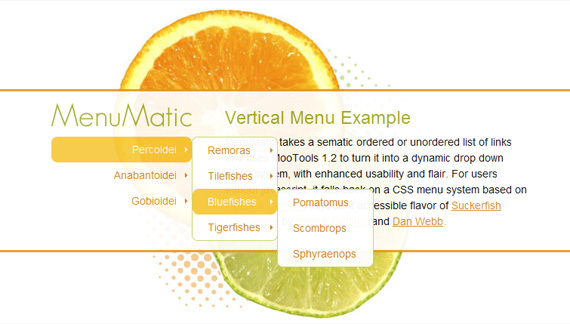 There are many ways to create a navigation menu for the Web. One of the most popular navigation menus is the accordion look drop-down navigation that slides up and down, showing its sub-menus when toggled. In this tutorial, we’re going to build a sliding navigation menu using CSS3, along with some jQuery codes to manage the sliding animation. There are two ways on how to use Font Awesome in our design project. The first one is by using BootstrapCDN link to your HTML markup and the second one is by downloading the Font Awesome files from the Font Awesome website and then use the Default CSS link to your HTML Markup. To learn more about this, you can check the Font Awesome getting started page. For this tutorial, I will be using the BootstrapCDN link to access the Font Awesome web fonts/icons. On our HTML file, we will add first the HTML5 doctype and series of links on our head section. This will include our link to the CSS file, BootstrapCDN link and our jQuery library file. 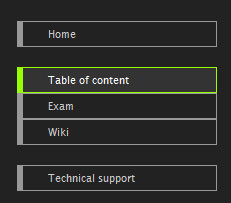 The HTML structure for the menu will be an unordered list where the parent menu element is formatted in an H3 tag. The H3 tag consists of an icon menu span wrapped in a div tag. The parent menu element will have a plus (+) or a minus (-) sign icon (when toggled) if it has sub-menu elements using Font Awesome web fonts/icons. Notice that Font Awesome used the icon (i) tag to show its icons. You can check here the Font Awesome code class database along with its icons. So by this time, if you will check this on your web browser, you will get the same output like the image below. The style for this tutorial consists of displaying the parent element block, and hiding the sub-menus of the parent menus, the background color, menu icons and the plus and minus sign icons. For this part, we styled the parent menus, giving them width and background colors together with hover and active states and styled the H3 tag, which is the parent menu title. Next, we will put the menu icons on the left and the plus sign icon on right. It is expected right now that you’ll have the same look like the image below. Lastly, we will be putting styles on sub-menus but, by default, we will hide them and then animate them using jQuery later on. You will get the same output like the image below. Then, I change all the icons back in the compressed state (the plus icon). Next, using toggleClass, I switch plus/minus icons on the previously stored element $currIcon. This tutorial offers web developers and designers a basic relatively simple understanding how to create a sliding menu navigation. There are a lot of styles for a navigation menu out there but this one gives you a foundation on how this sliding effect will bring magic to your CSS. You are free to play around and customize if on your own liking and design. Check out my live demo link above and see how this works to different browsers and let us know your thoughts about this tutorial. How about we add some great tooltips to any menu button on a website? Let’s go! Tooltips, also referred to as ScreenTips, are a great way to show more information or messages that appears when a cursor is positioned over a hyperlink, icon, images or any other element. There are many ways to create anchor link tooltips. The idea of tooltips came from older Microsoft applications like Microsoft Word. It had a toolbar where moving the mouse over the buttons displayed the tooltips. Begin by creating simple markups for the hyperlinks. You need a span element to utilize the content of the tooltip. 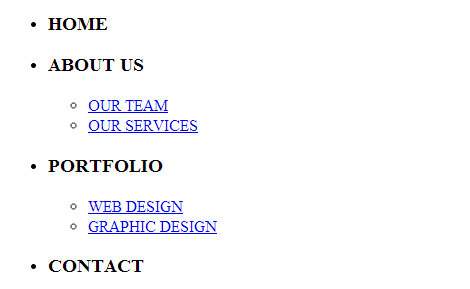 Also, put a class for each hyperlinks and style them later. Now that the markup is ready, apply some style to the anchor tag classes. After displaying the tooltips classes as inline link and giving it a position relative, add some styles now for the span elements by giving it a rounded box for the tooltip body. Remember to manipulate the position using margins and position properties to push them to the right positions. Using the :hover selector, make the tooltips visible. Position them respectively on mouse-over state. 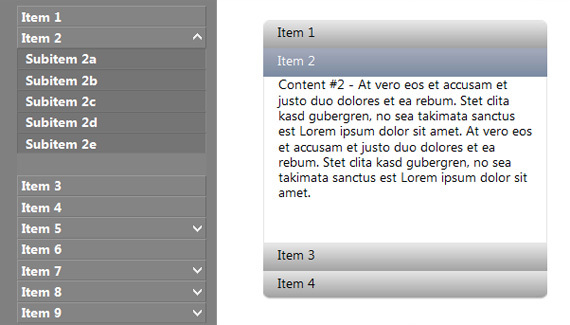 The :after selector will insert the contents after the selected element. Now that you now know how to create a tooltips, you can change the color of each tooltips. Changing the colors is not really that hard. 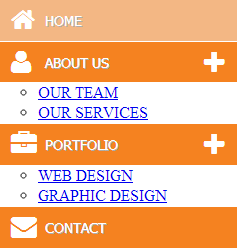 First, you need to go to the span element’s style and change the background to the preferred color. Next, you also need to change the border color of the position of the tooltip under :after selector styles. In the example below,the bottom position tooltip will be changed. First, you need to change the border-bottom color to your preferred color, similar to the color used above. 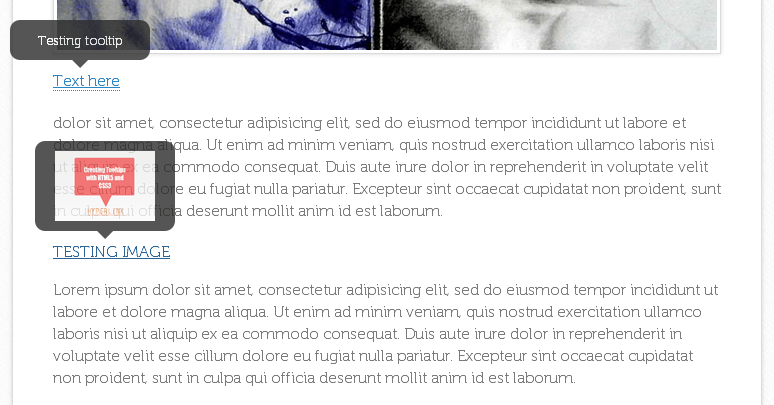 With the new CSS3 features, you can add some cool effects to the tooltips. For this part of the tutorial, you will learn how you can add some plain fading effects and a sliding effect. To create plain fading effects, you need to manipulate the opacity of the span element on its normal state and mouse-over state using the transition property. Add the code below to the tooltips. Notice that ease-in-out as the transition-timing-function was used to create a smooth fading in and out effect. Now to create a bouncing effect, you need to add translated3d value and a smooth transition on its mouse-over state. This will add a nice sliding effect to the toolkit appearance. Add the following code to the tooltips span element. There is really nothing special in adding images on tooltips. You just need to put the image link and give it the preferred height and width. 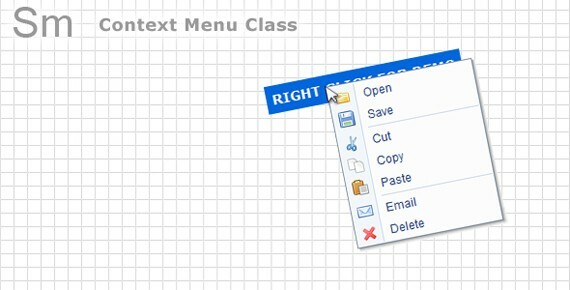 If you prefer to put a text on it, then, you can customize the style of the class for that specific tooltip. As an example, see the markup below. All done! You just made an awesome custom tooltips using HTML and CSS3. Although these tooltips were made manually, there are also other ways to do it like by using a CSS library like Hint.css or using a jQuery plugin like tooltipser.js. Please feel free to play around with the codes above. If this can be improved in any way, I want to hear from you. Please share the ideas on the comment section below. Hope you enjoyed this tutorial and see you again on the next tutorial! But what if you want to use tooltips in WordPress? Just keep on reading. Wouldn’t be great if you can also integrate tooltips on your WordPress site? Great thing there is a solution for that: WordPress shortcode. Shortcodes are WordPress-specific code that lets you do nifty things with very little effort. By just inserting something inside square brackets, it will replace that content with some other content and usually being driven by a series of PHP functions. Note: If you want to understand in-depth understanding about shortcodes, you might want to check this tutorial regarding the Theme Options Shortcodes. Shortcodes comes with two variations. Additionally, shortcodes can be created with or without attributes. Regardless of how dynamic or complicated your shortcode is, these steps are the foundation. You can place your shortcode snippets to plugins folder (on your theme directory) and then activate. But take note that it is commonly added on the functions.php file. However, for this tutorial, let’s create an additional file to keep the code clean without affecting the theme’s built in functions. Go ahead and create shortcode.php file on your theme’s root directory. For this part of the tutorial, add the primary functions. Since tooltips can also contain images aside from just pure text, create two functions namely: tooltip and tooltip_image. One of the great things about shortcode is that handlers are broadly similar to WordPress filters: they accept parameters (attributes) and return a result (the shortcode output). For this tutorial, you’re going to use the $atts and $content attribute to display your data. Basically the $atts will contain an array for your class, title and links and the content will refer to the item or text that these shortcodes will be wrap. Next, return your result using a variable $html, which will contain the content format. In order to execute the primary functions, you will tie it to WordPress’ initialization action. The name of the function will be the same to the name of the hook Shortcodes but feel free to change it to your preferred name. Now, with the CSS added from the previous tutorial regarding the CSS3 Anchor Tooltips and some new set of the same CSS for image_tooltip shortcode, let’s test the shortcodes. You did it! Now you can easily create all kinds of custom Shortcode functionality and integrate it into your WordPress site. Hope you learned something on this tutorial and don’t forget to always check the WordPress Codex for changes in the rules in creating a shortcode. Have you created the same shortcodes before? Share it with us on the comments section. Now you’re equiped for you task as a pro.